María de los Ángeles Félix Güereña (Spanish: [maˈɾia ˈfeliks] (8 April 1914 – 8 April 2002) was a Mexican actress and singer. She was known for the title role of Doña Bárbara (1943). She appeared in almost 50 movies made in Mexico, Spain, France, Italy and Argentina. Félix died on 8 April 2002 in Mexico City from a heart attack at the age of 88. 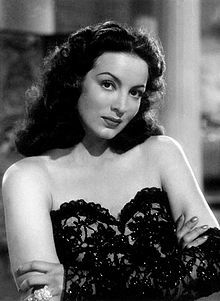 ↑ "María Félix: Mexican actress". Encyclopedia Britannica. Retrieved 8 May 2018. ↑ Pilcher, Jeffrey M. (1 December 2002). The Human Tradition in Mexico. Rowman & Littlefield Publishers. ISBN 9781461638421. ↑ Dillon, Sam (2002-04-09). "María Félix, 87, Feisty Heroine Who Reigned Supreme in Mexican Cinema, Dies". The New York Times. ISSN 0362-4331. Retrieved 8 May 2018. This page was last changed on 12 January 2019, at 10:16.